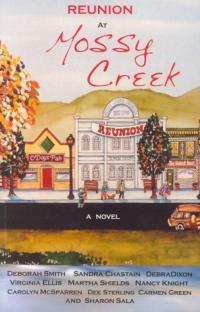 Return to Mossy Creek, when a class reunion stirs up more than just memories. Welcome back to Mossy Creek! The warm-hearted but stubborn residents of the small town whose motto is "Aint Going No Where - and Don't Want To" are once again sorting out the joys, sorrows, and everyday mysteries of life. This time around, they've got the added drama of the big town reunion commemorating the 20-year-old mystery of the late, great Mossy Creek High School, which burned to the ground amid quirky rumors and dark secrets. Are the villains who caused the fire at the grand old school finally ready to come forward? In the meantime, sassy 100-year-old Creekite Eula Mae Whit is convinced Willard Scott has put a death curse on her, and Mossy Creek Police Chief Amos Royden is still fighting his reputation as the town's most eligible bachelor. Then there's the new bad girl in town, Jasmine, and more adventures for the old girl in town, Mayor Ida Hamilton. And last but not least, Bob the flying Chihuahua finds himself stalked by and amorous lady poodle. All this and more - including the introduction of Mossy Creek's new recipe section, courtesy of Creekite Chef Bubba Rice - is waiting for readers in the second novel of the Mossy Creek Series.